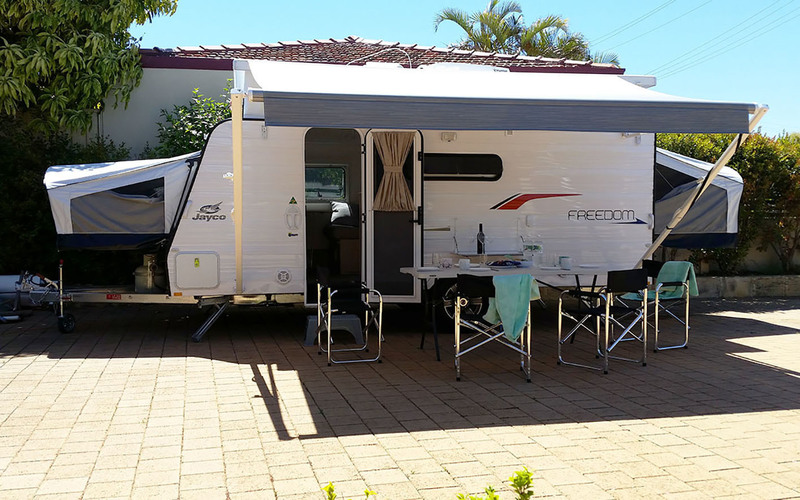 TOW: Our 16 foot "Freda", is perfect for families. 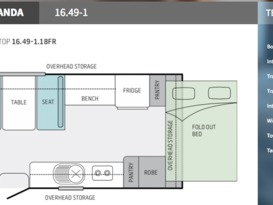 She'll sleep 4 adults comfortably, (plus room for 2 small kids on a "put-up"). 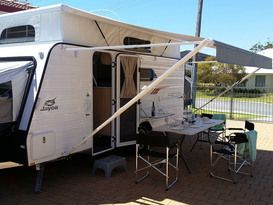 Surprisingly spacious inside, plus plenty of shade for Mum and Dad to relax under the Awning. 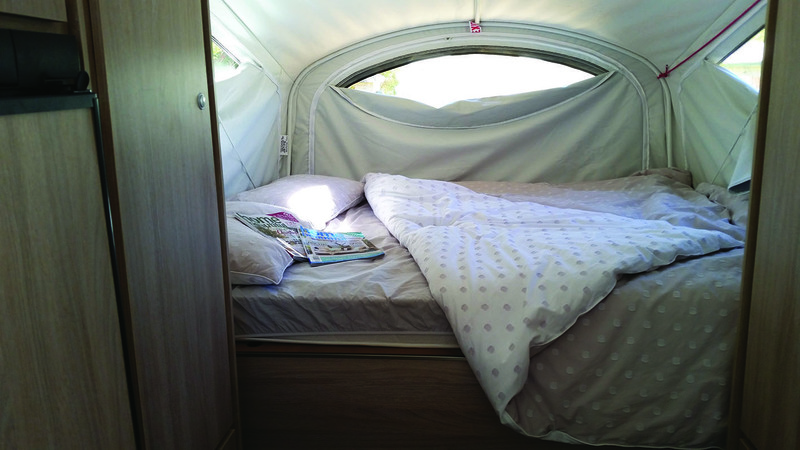 There's air conditioned comfort for the kids, or heating for the winter wanderer. 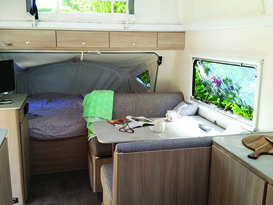 Freda is lightweight and easy to tow, quick to set up and fitted out with everything you need for a perfect break. Ask about our WEEKEND GETAWAY: Friday to Sunday or Monday. OWNER DROP OFF: Not comfortable towing? 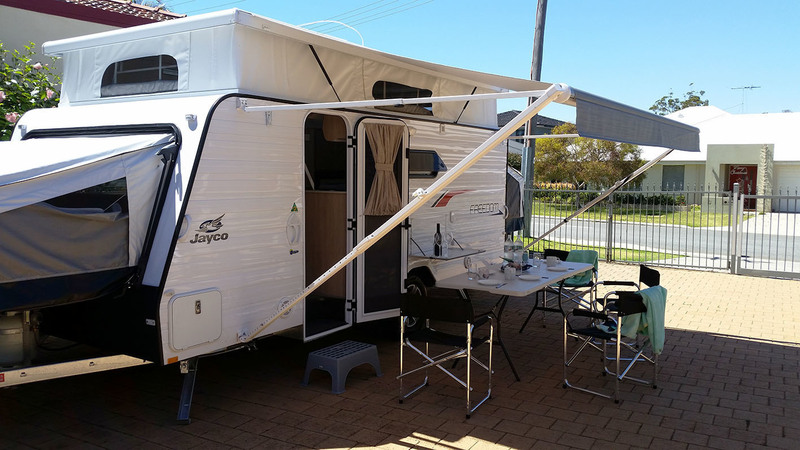 Ask us about Owner Drop Off, where we set her up at a campsite of your choice, (300km max from Perth, Relocation charges will apply). Make a booking request and we'll get back to you ASAP to answer all your questions. Freda is fitted with an ELECBRAKE Brake Controller. You will need to turn off / disable your Brake Controller, if you have one fitted. The system is simple and utilises your Smartphone and Bluetooth, the Owner will oversee the initial setup with you. 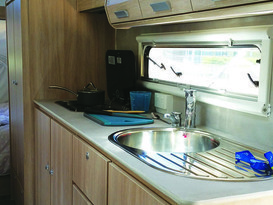 EXTENDED TOWING MIRRORS FOR A CARAVAN ARE REQUIRED BY LAW. If you cannot borrow any, I can hire you a set for $5 per day, up to 10 days, then $50 flat rate. • External Table and up to 6 Chairs. BASIC PANTRY: Tea, Coffee, Sugar, Rice, Pasta, Salt & Pepper, Sauce, etc. WEEKEND GETAWAY TOW: 2 nights or 3. PICK UP Fri. 10am to midday. DROP OFF Sun. (2 nights) by 6pm OR Mon. by midday (3 nights). Book through website. EARLY PICK UP & LATE DROP OFF charges may apply depending on arrangements. MINIMUM "TOW" RENTAL IS 2 DAYS. OWNER DROP OFF: Not comfortable towing? 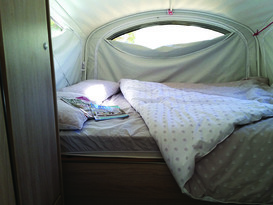 Let us Drop Off and Set Up the Caravan at any suitable campsite within aprox. 300 kms of Perth. There is a RELOCATION FEE of $50.00 for the first 50 kms, then $1.00 per kilometre from 51km onwards. This covers fuel for delivery & collection of the Van, plus set up & close down. 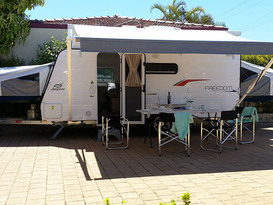 Therefore if your campsite is at Dunsborough, 263 km from Carine, the Relocation Fee is $263. 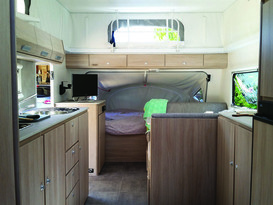 The Owner will meet you at the campsite at an agreed time and show you through the Van. Please be on time. 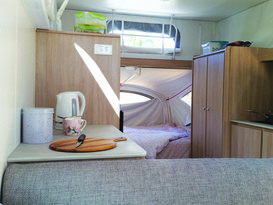 It is the Hirers responsibility to book, confirm and pay for the campsite ready for when the Van arrives. THE RELOCATION FEE IS NOT SHOWN ON THE PRICE GIVEN BY CAMPLIFY, it is an amount added as an extra BEFORE you finally agree to the price. MINIMUM "OWNER DROP OFF" RENTAL IS 14 DAYS. Please Note: Owner Drop Off Bookings should be WEEKEND TO WEEKEND because of Owners' weekly work commitments. PLEASE clean and tidy Freda well before return, we will withhold a cleaning fee of $150 if we have to clean it for you. • Drivers must be 25 years or older. • No Smoking in the van. • No pets in the van unless by prior agreement with the Owner. A bond may be charged. 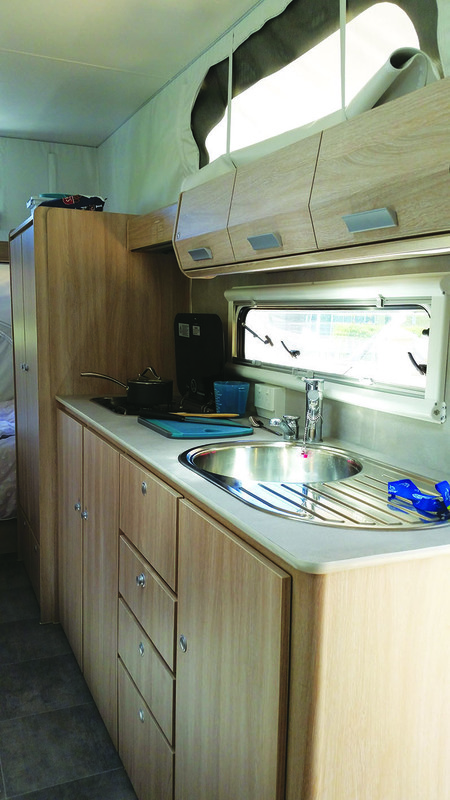 • Look after the van and return in a clean and tidy condition. 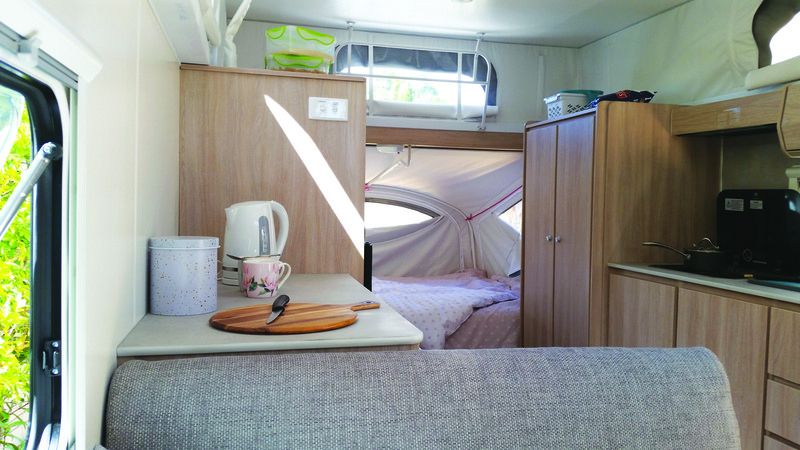 • This Caravan is NOT to be taken off road, it is a tourer and designed for sealed roads only. Short distances along well maintained gravel roads, to and from campsites are permitted, but please keep your speed down and remember any underbody damage will be claimed from you. Loved living in Freeda and it had everything we needed and more. Great set up! Paul was very accommodating and spent time showing us how it all worked. Thanks Paul! Paul was excellent and the communication was great. 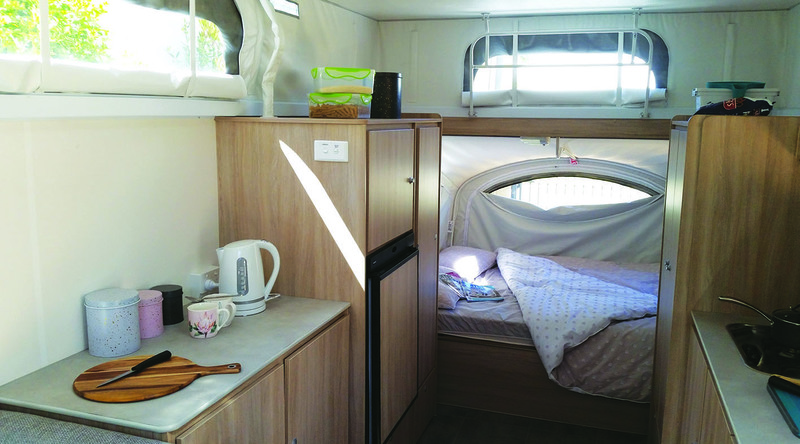 Being first time caravanners, we had no idea what we were doing but Paul was always willing to help and was very thorough in showing us how to use Freda. Freda was great for us. Very clean and basically brand new. Everything we needed was included and all we needed to take was our personal belongings. Quick and easy to set up and take down and Paul has written out some easy to use instructions so you don't miss anything. Would definitely recommend both Paul and Freda and have already done so to friends and family. Pauls Expanda was clean & very well equipped. 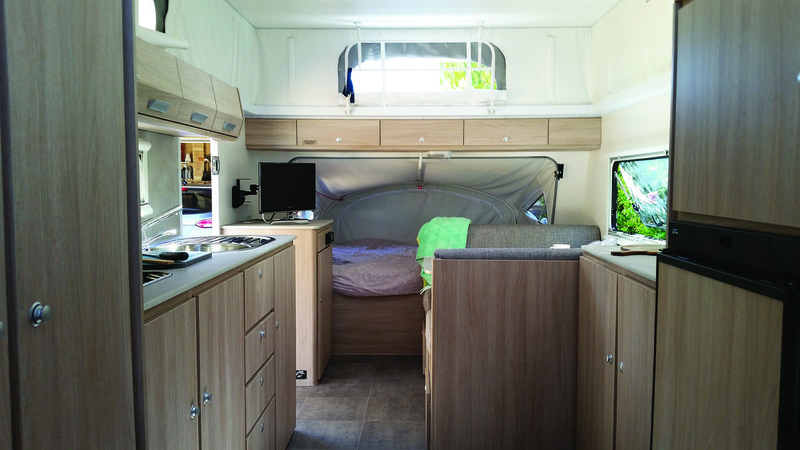 Expanda is very easy to tow, setup and pack down. Pickup & dropoff went also very smooth. We will definitely return to hire again. What a delight this was to hire Freda from Paul. 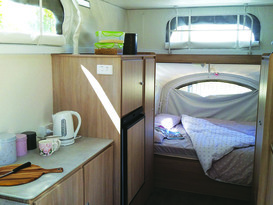 Fantastic handover brief by Paul and the caravan has everything possible you need for a great caravan holiday. 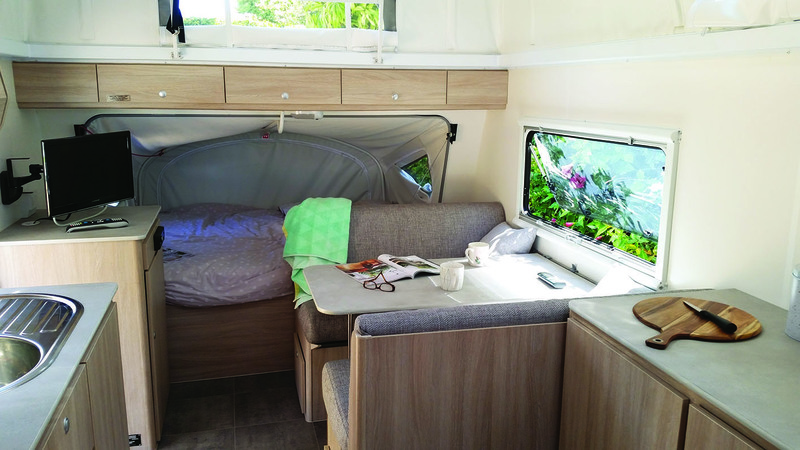 Extremely well kept (new) caravan and very easy to set up. I will be booking this caravan again from Paul! Hiring Freda was fantastic.... just what we needed, easy to put up and take down. Loved it. Paul is wonderful to deal with, he answered any questions I had, just a pleasure to deal with. I would highly recommend hiring Freda from Paul as you wont be disappointed. Freda was fantastic and Paul was great explaining everything. Great communication and Freda was perfect for our family of two adults and a 12 year old.